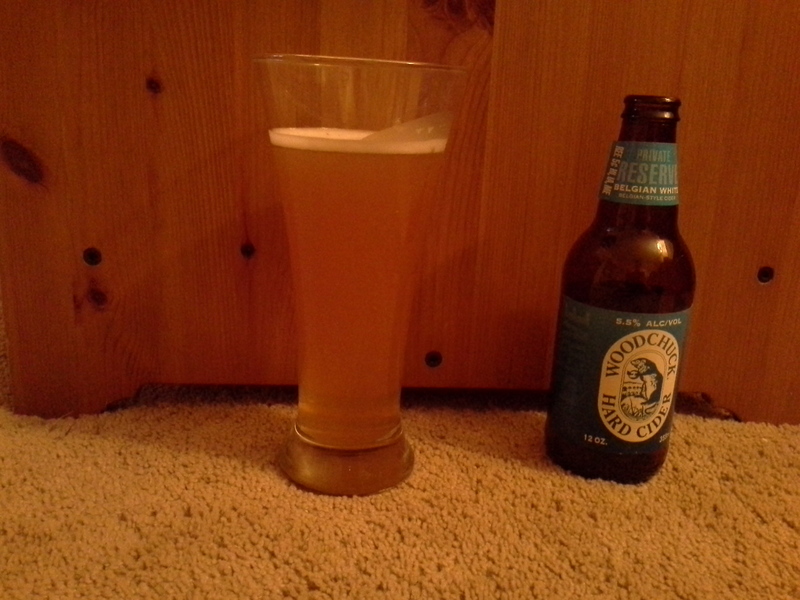 I have a white whale and that whale has a name: Woodchuck Belgian White Cider. Approximately two years ago I learned of this cider and I have been searching for it ever since. I was intrigued by the concept: Belgian yeast, coriander and orange peels in a cider? Yes, please. I have searched in three states: Pennsylvania, West Virginia and Ohio. But it always eluded me. Sometimes employees seemed to have heard of it or maybe seen it but it was never stocked when I was in their establishment. This all changed recently. My brother-in-law called me to let me know he’d tracked it down and did I want a 6 pack? Yes! Well, this disappointment was for the record books. Belgian? Well, I guess so far as it is cloudy it is “Belgian” but really, this cider was just one big meh. This may be due to the fact that I have been searching so hard for this cider for so long that in my mind I’d built it up in my mind to be something amazing…but whatever the case it is still a meh. I didn’t notice any coriander and I definitely didn’t pick up any notes of orange peel. The yeast is Belgian and that might be why there is a slightly “banana” flavor to it…I don’t know. Don’t get me wrong: I still enjoy Woodchuck cider. It is probably my favorite commercial cider. But this is one I’ll pass on if I ever happen to see it in the grocery store.